Speybank House, in Fochabers, is an impressive and historic house with a separate Coach House set in stunning private grounds. Currently owned by the Baxter family, of the world famous food manufacturers, properties of this nature are rare to the market and likely to attract many a foodie and property lover's attention. Originally built by the Duke of Richmond and Gordon for his factor, Speybank is arguably one of the most desirable and largest houses in the area. The property sits in a stunning and extremely private position at the heart of Fochabers, a thriving and pretty Morayshire village on the banks of the River Spey, with a packed calendar of arts, cultural and social events to enjoy. The house was previously one of the Fochabers' most popular hotels before the late Gordon Baxter purchased it in 1964 and converted it back into the wonderful family home it is today. The sale comprises not only of Speybank House itself but also a beautifully converted Coach House, well maintained extensive garden grounds and a field of approximately 4.7 acres offering excellent grazing for ponies or horses. Speybank House is thought to date back to the 1800s and is constructed of stone under a series of pitched slate roofs. The house provides extensive and flexible accommodation over two and a half storeys. The ground floor comprises an impressive dining room and a magnificent drawing room with an attractive open fire place and glazed doors to the conservatory. A passage leads to the rear of the house and to the kitchen, a spacious room with an Aga and seen many times on TV. Not only was it the kitchen in which Ena Baxter devised many of her famous recipes but it was also the set for numerous of her TV adverts. The ground floor even has its own Last Cast' bar, in which many a memorable evening has been enjoyed. On the first floor there are six double bedrooms served by three bathrooms. All of the upstairs bedrooms enjoy wonderful views over the private grounds. There is also a useful store room and WC whilst the second floor has two attic bedrooms and further storage areas. "Speybank is undoubtedly one of the finest houses in the area. With so many fine period features and a range of spacious rooms, the house could be used not only as a wonderful family home as it has most recently but possibly as a boutique Hotel or Guest House." "Many of the ground floor rooms have tall ceilings with ornate cornicing and plasterwork, open fireplaces with attractive surrounds and mantelpieces, working servant's bells and timber shutters. The interior dcor would benefit from a degree of modernisation however it would allow the new owners to put their own stamp on the property and breathe new life into a truly remarkable building." "To the west of the property, approximately nine miles away, Elgin provides a wide range of facilities including a leisure centre, hospital and retail park, as well as a train station with services to Inverness and Aberdeen. 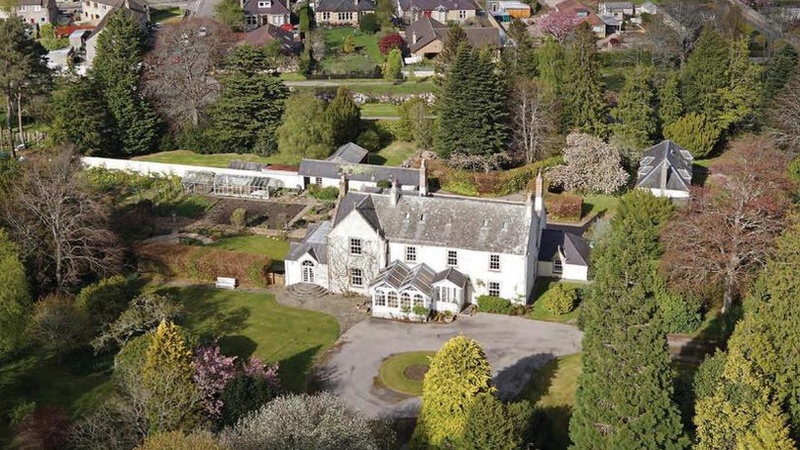 Private schooling is available at Gordonstoun about 14 miles away, whilst both excellent state primary and second schooling is available in Fochabers itself." In addition to Speybank House, the sale of the property also includes the charming Coach House. Converted into a dwelling in the 1980's the Coach House would be ideal for use by staff or elderly relatives or even potentially as a holiday or longer term let; generating an additional income for the new owners. The one and a half storey house has a sitting room, kitchen/dining room, cloak room and two bedrooms, both of which are en suite. Speybank is on the market with CKD Galbraith's Elgin office for offers over 850,000.